This is a patch that reworks Kryptopyr's Weapons and Armor Fixes and Clothing and Clutter Fixes to better suit Requiem's balance, and includes integrated Reqtified versions of True Orcish and Daedric Weapons and Faster Arrows. USKP/CCO fixes/keywords applied. I'm a friendly guy, but I put a good bit of brainstorming and number-crunching into Reqtifying various mods. If you want to use part of my work, some of my tweaks, or something to that effect, drop me a PM. If the changes you're looking to borrow weren't made by me (ala, from WAFR/CCF directly) talk to Kryptopyr. For clarity; I have only permission to patch these mods, none of the assets are mine and the credit goes to the original authors in full. Remedied final projectile mesh path; silver arrows now function as intended. Forwarded changes to REQ_VendorChest_Wizard_Dawnstar, reducing the amount of gold and animate lockpick scrolls. Forwarded changes to shock ammunition descriptions. Forwarded added Advanced Blacksmithing effect. Forwarded missing REQ_Advanced_Blacksmithing keyword to silver and steel katanas. Fixed Mace of Molag Bal's missing VMAD info; Requiem's new script will properly apply to the weapon now. Reverted low-tier heavy armor weights to remain consistent with Requiem. Forwarded changes to smithing perks. Forwarded REQ_Advanced_Blacksmithing keywords to Eastern weapons. Forwarded changes to crossbow bolt mesh paths. Forwarded changes to cursed items. Forwarded changes to food items. Changed Cinnabar Beer weight to be consistent with other similar-sized alcholic beverages. Fixed The Axe of Whiterun; it now uses the appropriate mesh at all times. Fixed the Shield of Solitude having incorrect attributes that were carried over from the USKP needlessly. Fixed an issue with The Rueful Axe using the wrong first-person mesh. Added ITMs to cover certain changes made by Requiem that should remain as they are (Archmage Robes enchant, Atronach stone perk). Carried over leveled list changes from 1.9.2. Reworked battlestaves in light of Requiem's 1.9.2 fixes to these weapons. Removed light armor mesh that was conflicting with USKP. Adjusted Thalmor hooded robes (including Ancano's) to be weight-consistent with the individual Thalmor robe/hood. Adjusted Ancano's gloves to be consistent with Thalmor gloves in terms of weight and base armor value. Adjusted Ancano's robe to keep his outfit's armor value consistent. Updated description with accurate versioning info. Fixed Stormcloak outfits; the remodeled Stormcloak Light Armor can now be found on NPCs. Applied filter condition to Ebony Smithing to prevent duplicate temper bonuses to Nightingale weapons, which temper with the Daedric perk. Found and fixed a bandit war axe leveled list (BanditHeavy_06) that had inconsistent temper rates when compared with other corresponding lists. 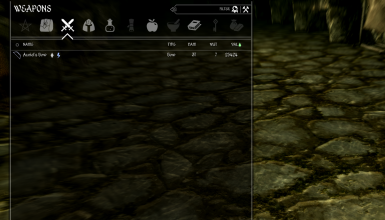 Fixed paths for Stormcloak heavy armor meshes (for gauntlets and boots). Applied WAF_MaterialFaction keyword to Requiem-added Imperial weapons (dagger, mace, shortsword). Revamped smithing perks to account for all material keywords from WAF to ensure proper tempering. Removed duplicate material keywords from Craftmanship, Dwarven, and Orcish Smithing. Ancient Nord Honed weapons and steel plate armor now gain a temper bonus from (only) the Advanced Blacksmithing perk. Skyforge weapons, Blades armor and weapons, Redguard weapons, Nordic weapons and armor, chitin heavy armor, and bonemold heavy armor (as well as improved) now temper with the Advanced Blacksmithing perk. Removed matching set bonuses from hidden DLC smithing perks (Requiem removes vanilla matching set bonuses). Renamed the Craftmanship perk to Craftsmanship for the sake of my sanity. Renamed 'The Craftman's Manual' to 'The Craftsman's Manual' for consistency (with both the renamed perk and its own in-game model). Stormcloak light armor is no longer completely inadequate protection. Set has been reworked and has new meshes courtesy of lifestorock (soon to be optional) featuring proper sleeves, as well as fur gauntlets and boots reinforced with leather plates. Due to the above change, the bracers and boots worn by guards now also feature leather plates. Stormcloak heavy armor (cuirass) has been adjusted to better suit its role, and has an (optional) new mesh (also courtesy of lifestorock) featuring a scale vest and iron pauldrons. Added (soon to be optional) Stormcloak heavy bracers and boots to complement the repositioned Stormcloak heavy armor, also featuring meshes by lifestorock. Heavily-armored Stormcloaks now use fur gauntlets and boots reinforced with iron plates. Made Mercer Frey's Guild Master's Armor consistent with that acquired by the player (in weight and armor value). His (nonplayable) Amulet of Articulation was buffed slightly, compensating for his lack of a hood (which the armor previously balanced). Overhauled dragon masks. There are now a relatively balanced number of masks serving as light armor, heavy armor and clothing, each with purpose-appropriate armor and weight. Removed a number of ITMs. Numerous minor (and not so minor) edits that can be easily discerned by reviewing the spreadsheets I made just for that purpose, now available in the 'Optional Files' section. Reconciled changes made by USLEEP. Updated for changes made to the Nightingale weapons. Added missing perk requirement to Arcane Craftsmanship. Updated plugin header to correspond to current version. Updated for changes made in Requiem 1.9.4/1.9.4.1. Adjusted Studded Armor to fill a new role akin to the Imperial Studded Armor's adjusted role in Requiem. 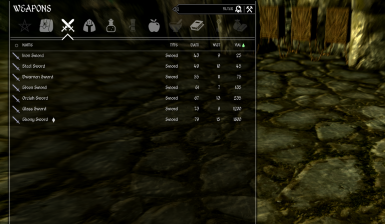 Repositioned numerous armors according to their new stats from Requiem 1.9.4. Updated for changes made in USLEEP and Requiem 1.9.3. Many thanks to 4rakhor for his assistance with this. Reworked some of the lower-end bows a bit to grant them consistency with regards to their value/material cost. Forsworn and Ancient Nord bows now deal their Requiem-dictated damage. The basic Ancient Nord and Falmer bows are now light bows. Ancient Nord and Falmer 'Supple' bows are now heavy bows, and deal damage that is appropriate for their material type and value. Ancient Nord and Falmer 'Supple' bows are now labeled as 'Strong' bows, to better represent their construction and new positioning. Bows based around Ancient Nord Supple Bows (Drainspell, Gauldur Blackbow) have had stats adjusted to keep them in line with the new Strong Bows. Adjusted the speed and gravity for Nord Hero and Nordic arrows, so they now each fulfill their intended roles. Deleveled a couple Dragonborn heavy armor leveled lists. Reorganized the .bsa to prevent overwriting of certain vanilla assets. Linked Stormcloak light gauntlets and boots to the new location of their assets. Edited the Stormcloak armor addons for the light gauntlets and boots for consistency with the aforementioned change to asset location. Added recipes for the fur guard's gauntlets and boots. These recipes are injected into Update.esm (as are their output), so they can be used by both COR and KFR users as needed. Added recipes and projectiles for elemental ammunition of all sorts, provided you are privy to the technology through one means or another. Forwarded Requiem's changes to unique item values. Fixed the material keyword on the Imperial Shield. Fixed a keyword mismatch on Auriel's Shield. Removed a number of ITM records. Added optional plugin to remove the new Stormcloak heavy armors. Fixed FOMOD installer. Really this time. It works. I tried it. Carried over projectile changes to certain bolts that had eluded the rework. Fixed FOMOD info.xml. Mod managers will now properly display the NexusID of KFR on install. Affixed appropriate acronym to plugin name for easier identification; Kryptopyr'sFixesReqtified.esp is now KFR-Kryptopyr'sFixesReqtified.esp. This is the only time plugin names will be changed. Nordic armor and weapons are now akin to Orcish gear in strength, but lighter. Stalhrim weapons are now akin to Glass gear, but stronger and a bit heavier. Stalhrim light armor is similar, and sits between glass and dragonscale armors in strength. Heavy Stalhrim armor is positioned between ebony and dragonplate. Reqtified various vanilla items overlooked in Requiem 1.8.2. Reworked projectile gravities and speeds across the board. Arrows and bolts have their own distinct mechanics. Bound arrow gravity reduced to 0.70 (-30%); speed increased to 5175 (+43.75%). Light arrow gravity reduced to 0.75 (-25%); speed increased to 4725 (+31.25%). Standard arrow gravity reduced to 0.80 (-20%); speed increased to 4500 (+25%). Heavy arrow gravity reduced to 0.85 (-15%); speed increased to 4275 (+18.75%). Massive arrow gravity reduced to 0.95 (-5%); speed increased to 3825 (+6.25%). Light bolt gravity reduced to 0.80 (-20%); speed increased to 7088 (+31.25%). Standard bolt gravity reduced to 0.85 (-15%); speed increased to 6750 (+25%). Heavy bolt gravity reduced to 0.90 (-10%); speed increased to 6413 (+18.75%). Massive bolt gravity remains 1.00 (-0%); speed increased to 5738 (+6.25%). Integrates True Orcish and Daedric Weapons while remaining as close to the original Requiem aesthetic as possible. Elven and Orcish weapons saw damage and values swapped where appropriate. NOTE: This patch requires Dawnguard, Hearthfire and Dragonborn, as well as all other files mentioned in the requirements section. Next on my list, and long overdue to have its own page. Let's talk about fixes. Let's talk about the most awesome set of fixes since the USKP; Weapons and Armor Fixes Remade, and Clothing and Clutter Fixes, and from a single author, no less (sorry rollo). These are two quite essential fix mods I really wouldn't play without, but unfortunately.. The fixes therein don't always play nice with Requiem. That's where this patch comes in. 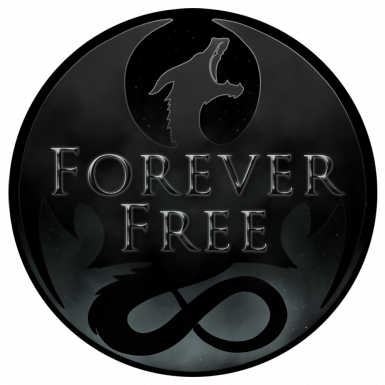 Formerly known as Requiem - True Weapons, this is a combination patch for Weapons and Armor Fixes Remade and Clothing and Clutter Fixes, to properly Reqtify the changes made. As noted above, it's a work in progress; this initial release doesn't contain the complete Reqtification of Kryptopyr's changes that I'd originally wanted it to, but this will change with time. 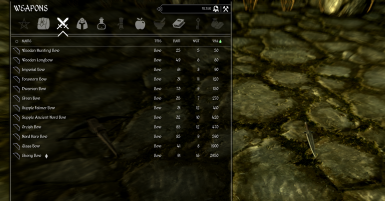 Despite its WIP status, Kryptopyr's Fixes Reqtified does do exactly what it advertises; offers an all-in-one Requiem patch for two of the best Skyrim "fixpack" mods on the Nexus, and includes fixes/keywords provided by the USKP and Kryptopyr's own Complete Crafting Overhaul Remade. RECOMMENDED FOR USE WITH THIS PATCH: "WITH ALL THE FIXES"
rest, there is one mod I advise using for both install types; Complete Crafting Overhaul Remade, as it provides great changes to smithing, and is by the same (awesome) author. Install Weapons and Armor Fixes Remade - Complete Plus. Want to fix more than just items? Use this extended installation guide if you will/do use the recommended mods! Install Run For Your Lives. Install Realistic Ragdolls and Force. Install CFR - Cloaks For Requiem (unless using COR). For best results, don't use a Bashed patch with this patch. However, if you absolutely must make a Bashed patch, make sure to uncheck the 'Import Names' and 'Import Stats' boxes, and definitely use the TES5Edit Script: Unlevel (or Re-Level) Leveled List by fireundubh to keep leveledlists unleveled; you will likely have to edit these leveled lists manually with TES5Edit to remove items of certain qualities (glass and ebony items aren't common in leveled lists, and daedric items are absent entirely) in accordance with Requiem. This is why I suggest instead using a properly-designed patch for Requiem. This patch does integrate True Orcish and Daedric Weapons as found in Weapons and Armor Fixes Remade. This doesn't mean, of course, that it patches other mods (like Immersive Weapons) for True Weapons; they will still require their own patches, which I highly recommend getting for the sake of consistency (and because it all just makes more sense that way). You do not need the "CCO_WAFTrueWeapons_Patch" plugin, however. Should be compatible with most anything (since we're just talking fixes here), but for the sake of preserving the edits made, I highly recommend loading it well after anything else that edits item stats. Last, but definitely not least, Azirok for the original WAF+CCF patch he provided me, Hard Times and all his other amazing Requiem patches. A note: If a mod is listed in the credits but not the requirements, it means certain changes were carried over for consistency/balance (or various fixes in the cases of USLEEP, CCF and WAF, for the purpose of compatibility). A thank you as well to the modders mentioned above for creating the awesome recommended mods in the "Extended install" for KFR, and to Vallen128 for the banner (I just tweaked it a bit). Thanks for checking out my Requiem 'fix patch', so to speak. If you like KFR and decide to endorse it, you should probably endorse the original mods too (it might seem a little silly not to). Also, if you enjoy a survival playthrough, feel free to check out my Requiem Survival Experience. On another note entirely, if you're a fan of complex weathers and ambient sounds, I might suggest checking out my Weather and Ambience Overhaul. Finally, while you're here, these are some (mostly) unrelated mods I would definitely recommend.